1 Sieve flours and sugar, add remaining ingredients and squeeze together with one hand until like short-crust pastry. 2 Either form into a round and put on a greased baking tray, prick well and mark into sections like cake slices, OR divide up into single, smaller biscuit shapes which will cook a lot quicker. 3 Bake at gas 3-4 until a pale beige (try 10 mins), then turn heat down and finish at gas 2 to firm the mixture without darkening. A large round will take about an hour; small ones about 20 minutes altogether. I have been labouring under the misapprehension that a bannock was some sort of scone variant, when it is clearly a form of shortbread. Interesting combination of ingredients – I don’t think I’ve ever seen candied peel in a recipe without raisins. Baking newbie tip 1: If a recipe requests corn, rice flour or potato flour, avoid the baking section of the supermarket where such things will be packaged for sensitive types and over-priced, in favour of the ‘World Foods’ section. In my local supermarket, a kilo of rice flour from a well-known fancy brand is £1.59 but a 500g bag in the adjacent aisle was only 59p. Good value and quality brands include Encona, TRS, Natco and Tolly Boy. The dough was rather dry and I had to add a small amount of water to get it to come together. Even so the edges frayed while baking. I baked the dough in a round, marked into 8 and ended up with pieces about the right size to fuel a good walk in the highlands. Very tasty and with a few tweaks, will be excellent. I thought they might turn out rather heavy what with all the kneading that took place before and after I added water to the dough, but the texture was lovely. (It was certainly lighter than an an all-wheat flour shortbread like this.) The flavour of the almonds was lost somewhat – I will use roasted almonds next time. A little more flavouring would also be an improvement – maybe vanilla , cinnamon, nutmeg or lemon zest. The overall proportions are perfect however – a great base recipe. Do you, dear readers, have a favourite addition to or variation on shortbread? Chocolate chips? Currants? Let us know in the comments. ETA: Definition of a Bannock from The Baker’s ABC by John Kirkland, formerly Head Teacher of National School of Baking, published 1927 by Gresham. A thick cake made of oatmeal, with a proportion of butter. Jamieson gives the word bannock or bonnock, and distinguishes it as an oat cake, as being baked on a girdle, whereas the latter is toasted before the fire after having been partly baked on a girdle. He quotes Ray as defining a bannock as ‘an oatcake kneaded only with water only and baked in the embers’. Pitcaithly Bannock is a cake of shortbread, made thick, in which a quantity of orange peel and almonds or other fruit is mixed. A name used for oaten bread or cake; also applied in Lancashire to wheat flour bread made with leaven and therefore with a distinctive flavour. This entry was posted in 1930s, Plain Cooking Recipes and tagged almonds, butter, candied peel, castor sugar, plain flour, rice flour. Bookmark the permalink. There’s a Jewish biscuit that’s remarkably similar, not least because it also contains candied peel but no raisins. And judging from the recipe and your description of it’s taste, I think they’d taste pretty similar too. Re. shortbread addition : Fortnum & Mason used to make the most amazing buttery chocolate chip variety that was sadly missing from their shelves on my last visit. I think it’s Duchy Originals that make the most delicious shortbread with butterscotch pieces in it. Raisin and currants, have absolutely no place in shortbread, or in scones either for that matter. Ooooh Carolyne, I should cross-check with my Jewish cookbook and compare! I always thought bannocks were scone like things too. Apparently I am not very in touch with my Scottish roots. I would add a quick note that you cannot use potato flour interchangeably with rice or corn flour. Potato flour is great for thickening sauces as it stays transparent nicely and gives a tasty looking shine. Hence it’s ubiquity in commercial products. But it tends to go spectacularly chewy in doughs and batters. which is one of my favourite Youtube videos of all time. Just to be really pedantic – I looked up ‘bannock’ in two (!) dictionaries. It’s a flat, unsweetened cake made of oatmeal, barley or pease-meal*, usually cooked on a griddle. Pretty basic tucker, eh what? * Split peas/marrowfat etc, I guess. Ah! So Miss S and I were right… sortof. The word ‘bannock’ sounds like the crucial part of an extreme sport (like ‘caber’) or a protective garment made of boiled wool (from a 19th century novel ‘Several well-worn bannocks were drying by the range’). I think I will stick to calling it shortbread. It’s probably a bannock-shaped shortbread – to attempt brevity. 1. Golden granulated or, better still, demerara sugar, instead of caster will add crunch, a slightly speckled appearance and hint of toffee flavour. 2. 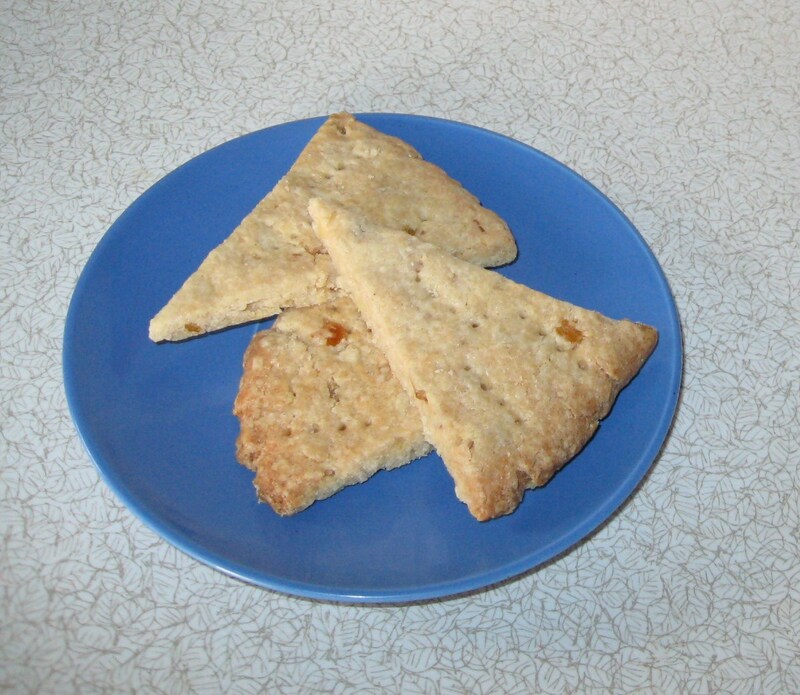 An American recipe used rolled oats instead of rice flour, and called it (ouch) “Scotcher Shortbread”. Coarser texture, but good. I think this is a westernized version of Bannock. Real Native American Bannock is kind of like a giant scone, but its not sweet and can be either baked or fried in oil. Cass, I think this is like the word ‘biscuit’ which means several things, depending on which country you’re in. It looks like Bannock is a Scottish word, which has been used to describe a Native American bread, which would surely have different names in different Native American languages.